Albany artist, Chelsea Hopkins-Allan, celebrates the beauty and diversity of moths from the Great Southern region in her exhibition, MOTH, at the Vancouver Arts Centre. Chelsea has spent the past year creating approximately 80 new artworks for the show, each depicting a different moth from the area. Moths are a great source of inspiration for the artist, symbolising the fragility, variety and complexity of nature as well as capacity for transformation. Chelsea, has undergone her own metamorphous in recent years due to a debilitating illness, with contemplation of moths helping her transition through the challenges. Chelsea’s fascination with butterflies and moths began as a child, but was rekindled six years ago when she was in an MRI machine during the onset of her illness. Lying still, in the dark for an hour, she tried to find something to calm her racing mind as she lay in chronic pain, not sure if she was soon going to die. She recalled looking through a microscope at a month's wing while at university and image brought her peace and happiness. It was a life changing moment. An epiphany. In the years since, Chelsea has transitioned from her work as an environmental scientist to exploring her creativity. She's hoping the exhibition will inspire people to share her delight and wonder in the intricacy, resilience, beauty and variety of moths from the area. Kentdale artist, Paul Moncrieff, has supported Chelsea in the development of works for the exhibition, Chelsea’s debut solo show. This guidance has been pivotal to Chelsea’s growth as an artist. 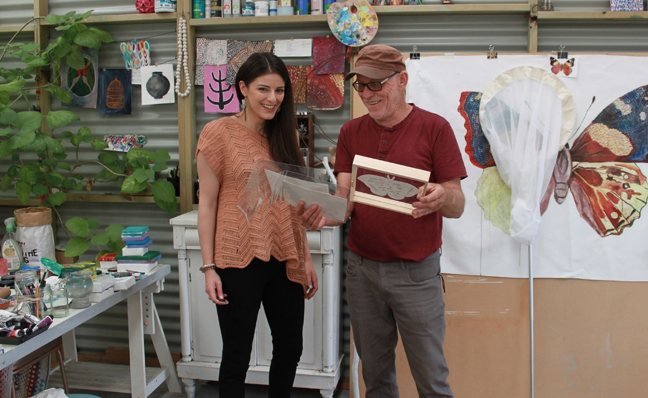 The mentorship is one of 50 regional arts mentorships undertaken across WA in the ground breaking, Regional Arts Partnership Program supported by the State Government of WA and Country Arts WA. Chelsea is also grateful for the support of the Australia Government through their Regional Arts Fund, the City of Albany and the staff at the Vancouver Arts Centre. The exhibition runs until February 19. The artist will be present in the gallery to talk about her work from 2pm to 3pm on Saturday February 9, and Saturday February 16, so be sure to head to the Vancouver Arts Centre, this is not to be missed!